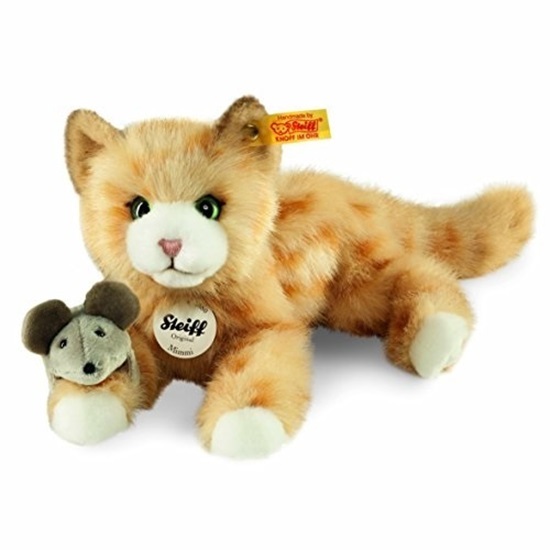 Mimmi Katze is a soft plush red tabby cat from Steiff's "Best for Kids" plush collection. This soft kitty is a little over 9 inches tall, and made from a soft woven fur. Mimmi Katze has green glass eyes and a hand stitched nose and mouth. A little gray mouse is attached to this kitty's front paw. Mimmi Katze comes with a yellow tag "Button in Ear" and is machine washable. This pretty kitty is good for ages 3 and up.